Chamilia offer a delightful range of charms, perfect for forming your own bespoke jewellery to express your interests, traits and tastes. 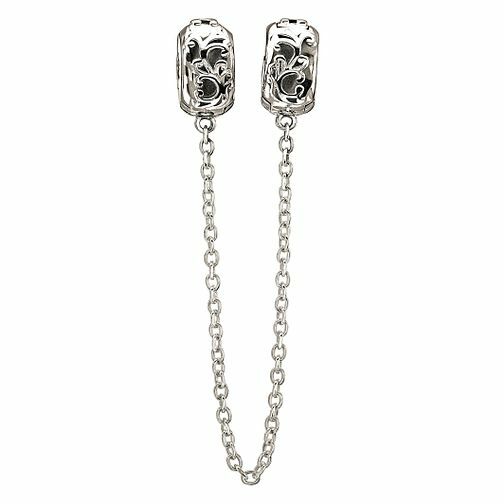 These two beautiful engraved charms made from sterling silver are linked together by a chain, designed for securing on each end of your bracelet to prevent the charms coming off should your bracelet come undone. Chamilia Filigree Lock with Safety Chain is rated 4.6 out of 5 by 9. Rated 5 out of 5 by Anonymous from Quality product very good price Delivery very quick lovely item as good if not better than Pandora and allot more reasonably priced. Would like a bigger choice of charms but very nice all the same.